The contract to build St. Philip's was entered into in June 1952, construction beginning in September. The church building was located in Barry Street, near Vincent Road, the opening and dedication took place at 2.30pm on Saturday, 28th March 1953. The ceremony was conducted by the Bishop of Gippsland, Rt. Rev. D. B. Blackwood. The building was of weatherboard construction with a tile roof, the designer was Mr. S. P. Ashton of Maffra, and the builder : Mr. S. G. Winchester of Morwell. The church was situated on a parcel of land measuring approximately two acres, the site having been purchased from the Housing Commission at a cost of 2,600. Construction costs were approximately 5,000. The first services at St. Philip's were conducted on 5th April 1953 - Easter Sunday. 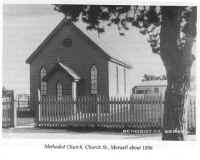 The original Methodist church building in Morwell was constructed on the corner of Station Street (Princes Drive) and Church Street in 1883, the church's property extended through to Buckley Street. The site was sold to a consortium of developers in May 1950. On September 12th., a meeting of Church trustees decided that a special commemorative service would be held on Sunday September 17th to mark the final service at the site. The church building was moved during the following week. A new one acre site, approximately one kilometre further east along Princes Drive was purchased from Mr. R. J. Hill for the re-establishment of the church. The old church building, having been relocated at the new site, was officially re-opened on Sunday, November 26th. The service was conducted by Rev. A. A. Lyons, a former minister of the Morwell circuit. The Parsonage, located behind the church at number 6 Doherty Avenue was officially opened on Saturday 20th September 1952. The ceremony which began at 2.30pm was performed by the Rev. Robert Jackson (Chairman, Gippsland North District). Several Church and Parliamentary dignitaries were in attendance. In January 1953 the church trust through its secretary Mr. Harold Butler invited tenders for the construction of a new brick building on the Princes Highway site. Tenders closed 4 p.m. 9th February. The successful tenderer Mr. Wes Jones moved onto the site on 23rd March. On Friday, 27th March, the Rev. Robert Hunt turned the first sod of earth for the new church building. The ceremony to lay the foundation stone for the new St. Luke's church took place on Saturday 2nd. May 1953. The ceremony was performed by the Rev. W. J. Hunkin (Chairman of the Gippsland North District). Rev. Hunt presented Rev. Hunkin with a trowel made by Mr. Butler especially for the occasion. During his speech Rev. Hunt gave special thanks to Mr. Stan Frew who had acted as honorary architect for the project. The new building, which faced onto Princes Drive near the McDonald Street corner. cost in the vicinity of 7,643 to complete. The construction was of solid brick with a terra cotta tiled roof. The outer walls were of Yallourn blue bricks, while the internal bricks were Traralgon silica. Natural lighting was aided by the installation of eight: 9 foot by 2 foot six inch side windows. The building measured 81 feet x 32 feet and had a seating capacity of 220, with provision for 35 members of the choir. The front of the building rose to a height of 33 feet at the apex. The interior furnishings were fashioned from Australian mountain ash. The new church building was officially opened on Saturday, 17th. October 1953. The following clergy were Ministers at St. Luke's during the 1950's. St. Luke's Church Hall was officially opened on Saturday 20th July 1957. The ceremony was performed by Reverend Kingston Daws, President of the Methodist conference. The building cost 12,000 to construct and a further 1,500 to fully furnish. A "folding church" was established in Robertson Street in July 1955. A force of willing volunteers led by Will McRoberts completed the building's interior and exterior decoration. The temporary building was officially opened on Sunday 24th July. Reverend Alec W. Pederick (President of Methodist Conference) performed the opening. The superintendent minister, Rev. Derbyshire conducted the special service. During the opening service, Pastor William Alexander Bramley was inducted into the Pastorate and Circuit. Pastor Bramley conducted the first regular services on Sunday 31st July. Sunday School began at 9.45am, with the evening session commencing at 6. Sessions were held on a fortnightly basis. The original St. Luke's building was re-located to Morwell East and officially opened on Sunday 28th April, 1957. The Reverend D. Risstrom from Warragul(Chairman of the district) performed the opening. St. Vincent's was established in temporary accommodation in Barry Street, Morwell East in 1954, a more permanent structure was established in 1957. Father W. J. Caffrey was the first Parish Priest, He was appointed to the position on 1st. September 1957. Father Caffrey stayed at St. Vincent's until 1959. His replacement was Father F. O'Regan. Official Baptist services began in Morwell on 7th May 1950, they were conducted at the Masonic Hall in Hazelwood Road. The services were led by Rev. G. E. Williams. In late 1951 a small timber building was constructed to house Baptist services. The facility was located in McDonald Street. Construction costs totalled approximately 4,000. Church officials received a 2,000 grant from the Government to help offset this heavy outlay of capital. The building was officially opened on Saturday, 26th. April 1952, at a special service which began at 3 p.m.
Services at the new building, on Sundays, were held at 11 a.m. and at 7 p.m. Sunday school was conducted at 2.30 p.m. The site for St. Columba's was chosen in November 1951, it was situated on the corner of Vincent Road and Vasey Street. In 1952 church authorities purchased a large building (80 feet x 32 feet) from A.P.M. Ltd. to be used for a Sunday School and youth work activities. The building, which was situated in Maryvale Road, was cut into two sections and moved separately to the Vasey Street site. This operation was carried out in may 1953 by G. Ross & Co. The time delay between the purchase and the removal of the hall was caused by difficulties in land allocation. The new facility was officially opened on Saturday 1st. August. Meetings were initially held in the Scout Hall led by Mr. J. G. Shaw. The Shire Council approved plans in July 1950 for the construction of a new church building. The site selected was near the corner of Church and Winifred Streets, diagonally opposite the site of the "La Mode" clothing factory. The final service conducted at the Scout Hall occurred on Sunday 2nd. November 1952. The Winifred Street Chapel was officially dedicated on Saturday 8th November 1952, the service which began at 3.30p.m. was led by Mr. W. W. Saunders, President of the Victorian Churches of Christ. Also in attendance were Canon Phillips (Anglican Church), Rev. G. Williams (Baptist Church), Rev. R. Hunt (Methodist Church), the Shire of Morwell was represented by the president - Cr. Alan Hall. The chapel was built by the congregation. The honour of turning the key in the door went to two stalwarts of the church, Mr. E. H. Reid and Mrs. C. Blucher. After the dedication service a special tea was held at the Town Hall from 5 p.m. The guest speaker at this service was Mr. E. L. Williams, M.A., principal of the College of The Bible, which was located in Glen Iris. The church hall was officially opened on Sunday 27th November 1955. The hall was also built by volunteers. The Salvation Army opened a citadel in Morwell in 1955. Situated on the Princes Highway on the eastern corner of Hoyle Street, the building was officially opened on Saturday, November 19th. The foundation stone was unveiled and the door opened by Commissioner Charles Durman, Territorial Commander for the Salvation Army in Southern Australia. Whilst performing his official duties, Commissioner Durman stated that " In the Latrobe Valley, we are witnessing the greatest population intake in the whole of Australia. Consequently, our need here is greatest. All halls are built for whosoever may come; the Salvation Army has no preferences. Morwell will be a mighty centre, not only for industrial and cultural works but for the righteousness of men". The official proceedings were conducted by Brigadier R. Darlow, Divisional Commander for Eastern Victoria. During his speech, Brigadier Darlow made mention of the vital role played by the Yallourn Corps in the establishment of the facility in Morwell. The Property Secretary, Brigadier A. W. McInnes, praised the efforts made by Captain Grieve from Yallourn. The Shire President, Cr. Alan Hall and Mrs. Hall, were among the guests at the opening. The hall was built by Mr. G. R. Jones. Brigadier McInnes thanked Mr. Jones for his speedy and efficient work and also for adding many extras to the building at his own expense. The total cost of the project amounted to 9,250. Salvation Army headquarters made a gift of 3,000 and arranged a further sum in the form of a loan. The St. Mary's Church building opened on 7th February 1886, situated in Chapel Street near the Morwell School. The building was small but served its congregation for many years. The final service at the Chapel Street site took place on the 11th January 1956. It was decided to re-locate St. Mary's to the corner of Latrobe Road and the Princes Highway on land near the rectory and Parish Hall. The new building of solid brick construction was designed by R. S. Demaine and Associates, a Melbourne firm of architects. Their Morwell representative was Mr. Donald Webb. The building contractor was L. W. Parrick Pty Ltd. Construction works began at the site in December 1957. The new St. Mary's had a floor space of approximately eighteen squares. The structure was designed to offer a place of worship that could be converted to a hall and social centre when a more substantial church was erected in the future. 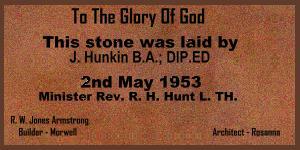 The new church building was dedicated by the Right Reverend Bishop P. W. Stephenson on Saturday 29th March 1958. Miss Emma Bridle laid the memorial stone for the new building in recognition of her long and outstanding service to the church.